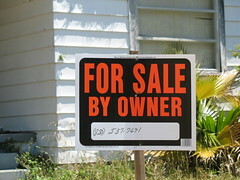 Is Pensacola Real Estate Moving Towards A Seller’s Market? 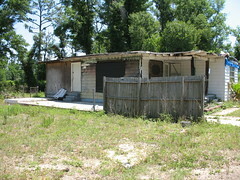 I’m not much of a real estate expert, but when I spotted this diamond in the rough I thought, “Surely this marks a trend in the the market.” I mean if there are expectations of selling this prime property then I have several bridges and some swamp lands that you may be interested in. Seriously though, I was on my way to pick my son up from school and passed by this… umm… well let’s just say it… crack house. It’s never been anything but bad news since it’s been there. In fact there used to be a privacy fence that went around in front of the property, which I’m sure all of the neighbors were happy about. Of course that probably made it hard for the police to stake the joint out so it was torn down not too long after it was up. 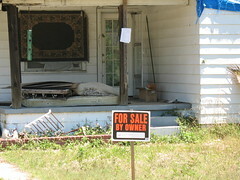 Anyway, when I saw the “For Sale By Owner” sign I laughed so hard that I nearly hit the Eiffel Tower. Yeah, I live in Florida… that’s how wide I swerved. Of course there is plenty of curb appeal here. They’ve gone with a nice Floridian tropical feel as you can see the palms and blue tarp. 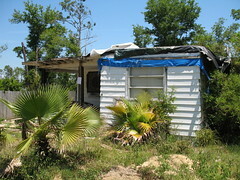 The property is situated so that the backyard is right off of I-10 so you would think that sound may be an issue. Not so what with the Persian rug over the front window and all. This beauty has upgrades as well. The master suite has a skylight. What? You didn’t see the mattress on the front porch? That’s the master suite! You get a nice view of the stars and you have that nice Florida breeze to cool you off. Well, as long as you don’t mind the 99% humidity. All you need is a can of Off Deep Woods Insect Repellent by your bedside and you’re good to go… or sleep… maybe. Ok, ok I’ll be honest. It’s not as good as I’m making it out to be. If you go around to the side you can see that it needs a little work on the siding. 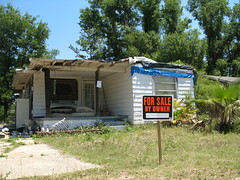 Some people might even consider this a fixer upper, but I’m not sure I’d go that far. This is just a historical home that needs a little bit of TLC, that’s all. Alright, enough chit-chat. Step right up! Shall we start the bidding at… Any takers? No? Well, you can view the whole photo album on Flickr if you want to by clicking on the last photo below. If you are interested here’s the number as well; I’m sure the owner won’t mind me giving out the number. It’s free advertising after all.